NEW York has awoken in shock to a city devastated by deadly superstorm Sandy, which killed at least 10 people and threatened to leave days of chaos in its wake. A record tidal surge thrown up by the hurricane set off an explosion at a power station, fire destroyed dozens of homes in the Queens district and a major hospital had to evacuate more than 200 patients at the height of the storm. Subway trains and buses remained suspended for a third day and hundreds of thousands of homes face up to a week without electricity, the power company warned. The stock exchange in what Americans call the city that never sleeps remained closed for a second day. At least 10 people were killed but that toll might rise, Mayor Michael Bloomberg said. The fatalities included a man crushed by a tree in Queens. Smoke lingered over many streets after a huge fire tore through 50 homes in the Breezy Point district of Queens. Firemen in boats rescued about 25 people trapped by fire. The homes were left a tangled mess of wood and metal. Breezy Point is near Rockaway Beach, where firemen rescued several people trapped in their homes by a 4.2m storm surge. Upturned cars were left strewn across streets near the Rockaway seafront. A spectacular explosion at a Manhattan electricity sub-station at the peak of the storm cut power to 193,000 homes on the island. 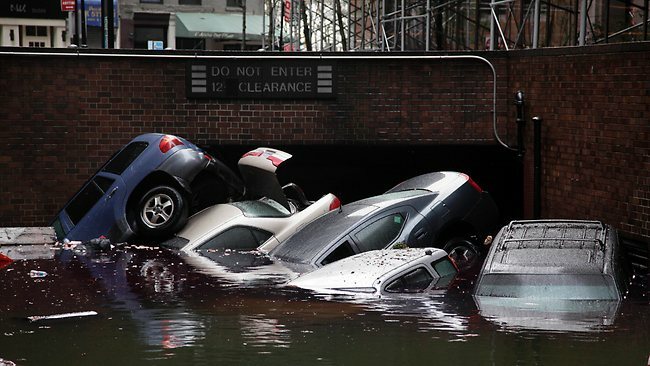 About 300,000 other homes in New York lost electricity as Sandy tore down trees and flooded power transmission facilities. "Don't be surprised if it takes a week" to get power back, warned Con Edison electricity company spokesman Alfonso Quiroz. Many roads remained blocked by trees, and road tunnels were inundated by floodwaters that slowly receded after the city was battered. Bridges off Manhattan were only open to emergency services. Some subway stations had water above platform level and it was expected to be several days before trains were fully operational again. Metropolitan Transportation Authority (MTA) president Joseph Lhota said the New York subway "has never faced a disaster as devastating as what we experienced last night." Police and ambulance sirens dominated the diminished morning traffic. Pedestrians had to avoid trees torn up by the wind gusts of up to 150km/h that hit the city late Monday. The streets of Lower Manhattan were pitch black until the sun rose. But the power cuts left giant apartment blocks without elevator service. "I have no water, no gas. I walked down 20 flights of stairs to get to street level and now I must try to get to the office," said accountant Joseph Warburton as he headed for Midtown along Third Avenue. Tommy Flynn, a 57-year-old photographer, said he was preparing to spend several days at home without electricity. "My girlfriend and I have stocks of water, instant food, batteries, candy and chocolate. And we have nowhere to go," he said. The roads were strewn with uprooted trees, telephone booths ripped off their foundations and traffic lights blown down with wires left exposed. Some caretakers bravely started to sweep up the leaves and branches in front of their buildings. New York University's Tisch hospital had to evacuate more than 200 patients, including about 20 babies, when it was caught in the power cuts and its backup generator failed. Long lines of ambulances were still taking patients away on Tuesday morning. Safety experts also nervously watched a crane over a 90 story luxury apartment block that buckled in the gale force winds. The boom of the crane swayed in the fierce gusts over streets near Central Park, which police and fire services evacuated because of the risk that it could fall. In another spectacular demonstration of its power, the hurricane pulled off the facade of a three-storey building in the Chelsea district. No injuries were reported.